The ongoing Mid-Atlantic power outage got me thinking about what I would miss most during a blackout. Air conditioning, hot showers, refrigeration, Internet access, gasoline, and use of my cell phone would be at the top of my list. Other, smaller deprivations would include working light bulbs, use of my bang-straightening wand (my head is one giant cowlick), and my daily tall glass of cold tea, lemon and ice. 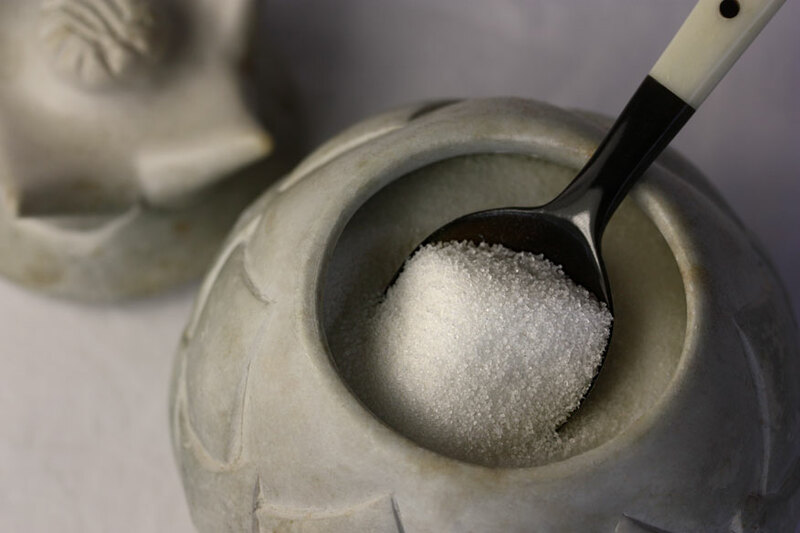 Ask any Texan, and they’ll tell you that the key to a good glass of tea is the perfect level of sweetness, but many people these days eschew traditional white table sugar. While waiting for a prescription to be filled at People’s Rx this week, I browsed their grocery section. (I’ve only just recently discovered this holistic, friendly and funky convenience store/compounding pharmacy/school of nutrition.) Because the space is quite small, there’s room for only one brand of each product — one olive oil, one vinegar, etc. I got the feeling that I was picking through a carefully curated selection. Janet, a wellness consultant, wandered over and asked if she could be of assistance, so I asked her about coconut vinegar. She seemed much more excited about coconut nectar, with its low glycemic index, so I bought a bottle thinking it might be a more healthful way to concoct my precious iced tea. The following morning, I tried it on hot oatmeal instead of my usual maple syrup. It was delicious! Although I prefer the flavor of maple with cereal, it showed great promise as a general sweetener. I then drizzled it on a buttered waffle; it tasted great, though again, if I had maple syrup in my pantry, I’d reach for that first. Next, I tasted the coconut nectar straight. 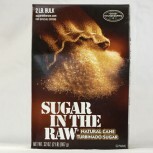 Unlike corn syrup or table sugar, it had a subtle flavor that was difficult to profile. It didn’t taste as caramel-y as I expected; the color reminded me of brown rice syrup, so I opened a jar and compared them. The brown rice syrup tasted dull in comparison. The coconut nectar was milder, but brighter, with the slightest hint of citrus. I finally worked up the courage to try it in a glass of iced tea. This presented my first big problem: the nectar stuck to the spoon and refused to dissolve. So I brewed up a fresh batch of tea, and when it cooled a bit but was still warm, I divided it into one-cup portions and poured it into several glasses along with one tablespoon of a selection of sweeteners I had in my pantry. I tasted each glass and made notes, then added a half-teaspoon of lemon and tasted again. Finally, I tasted all of them straight. Here are my observations (pricing is as of July 2012). Granulated Imperial Sugar / Made from cane sugar. / Cost: $0.04 per oz, purchased from HEB, Austin, TX: Everyone knows what white sugar in tea tastes like, but I needed a baseline comparison. Sugar is my go-to standard for sweeteners, but it always leaves a slightly unpleasant “morning mouth” aftertaste. 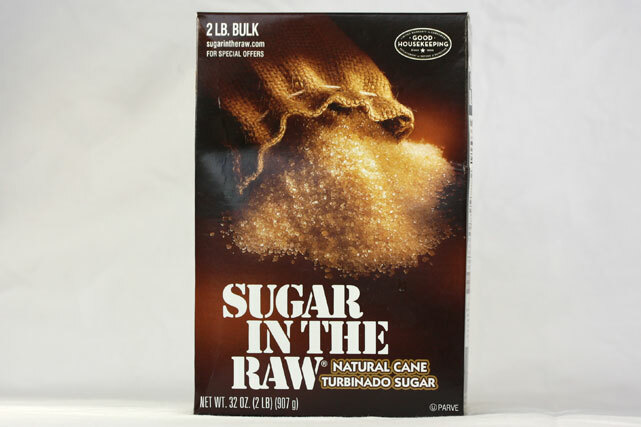 Sugar in the Raw / Natural cane turbinado sugar / Cost: $0.09 per oz, purchased from HEB, Austin, TX: I keep Sugar in the Raw in my house because its chunky texture helps with muddling mint for mojitos. It has more of a ‘sugar’ flavor than even traditional white table sugar, It’s very good in iced tea. 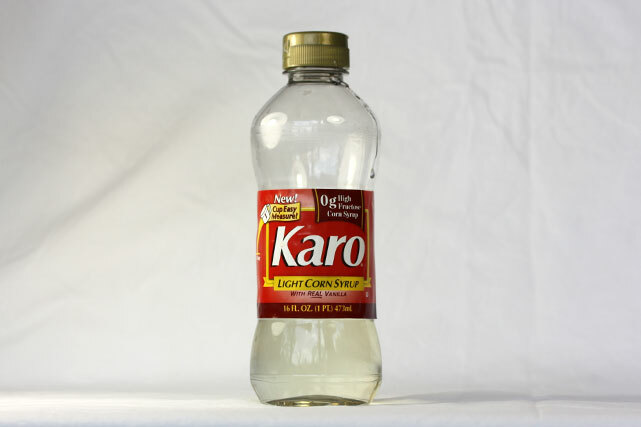 Karo Light Corn Syrup / Cost: $0.13 per oz, purchased from HEB, Austin, TX: High Fructose Corn Syrup (HFCS) is the Great Satan of sweeteners (read this to find out why), so I try to avoid it completely. Surprisingly, it was not as sweet as any of the other sweeteners I tested. It has a very clean flavor. If I didn’t know better, I’d probably prefer Karo in my tea. Coconut Secret Raw Coconut Nectar / Cost: $0.77 per oz, purchased from People’s Pharmacy, Austin, TX): Coconut nectar’s main drawback is that it doesn’t want to dissolve in cold drinks, and once dissolved, it turns the tea cloudy. It has an earthy aroma and a nice, slightly tangy flavor, but it’s a bit too strong for iced tea. 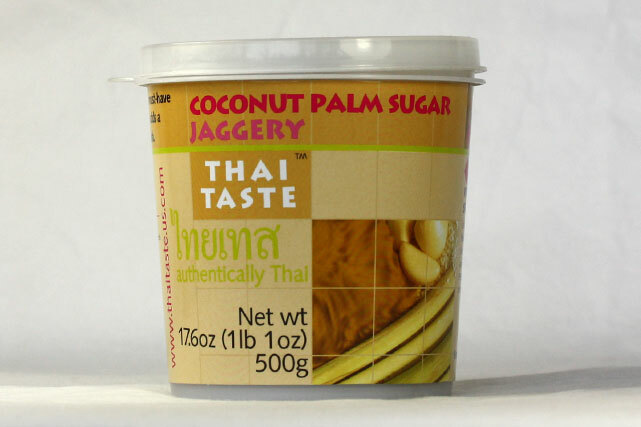 Thai Taste Coconut Palm Sugar / Cost: $0.40 per oz, purchased from Central Market, Austin, TX: This product used to be called Jaggery but is now labeled Namtarn Peep, (I’m thinking this will be my next alias). 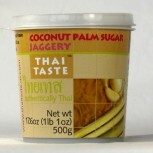 The taste is similar to coconut nectar, but stronger — its also made from palm tree flower sap. Not suitable for tea. Virgin nectar is evaporated at low temperatures to ensure that enzymes remain alive and active. 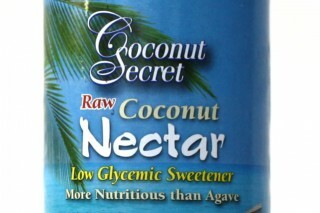 Coconut nectar has a low glycemic index score of 35. (This is good! Low glycemic foods score from 0-55; medium GI is 56 – 69, and high is 70 – 100. 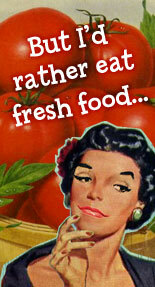 Read this for more info on why you should eat low glycemic foods.) It also contains 74% sucrose, 10-12% glucose and 10-12% fructose. 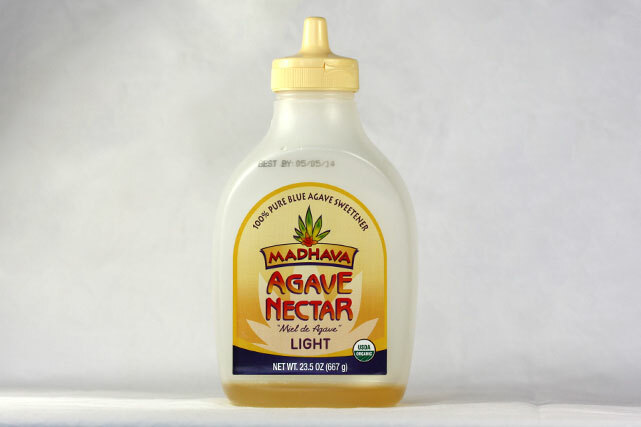 Many sweeteners, such as agave nectar, contain high amounts of fructose which, rather than being processed by your body’s cells, head straight for your liver and can raise blood triglyceride levels. This can trigger atherosclerosis, increase fat deposits around the viscera, and decrease insulin sensitivity in overweight people. Read this for more info. It contains 17 amino acids, minerals, vitamin C, broad-spectrum B vitamins and has a nearly neutral PH. It’s rich in probiotics, is 100% organic, and is gluten-free, dairy-free, GMO-free, vegan, and kosher! Read this for more health info on coconut flower nectar. 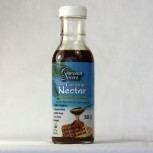 I’m still going to stock up on Coconut Nectar for cereal, coffee, and cooking because of its many health benefits. Compared to granulated sugar or corn syrup, which I’ll also be storing, Coconut Secret Organic Raw Coconut Nectar is pricey, at $0.77/oz. (However its less expensive than most organic Grade A maple syrups which average $0.98/oz.). Because diabetes runs in my family I figure I’d rather pay a little bit more now than much more later for medical bills and higher health insurance rates, not to mention pain and suffering. As previously noted, I bought mine at People’s Rx in Austin. If you’re not near a People’s, click here to find a retailer near you. Zoe recommends you call before you visit; the store locator indicates that a Coconut Secret product is sold there, but not necessarily the coconut nectar. 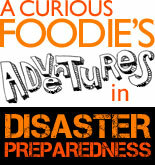 You can also buy it from Amazon, here. 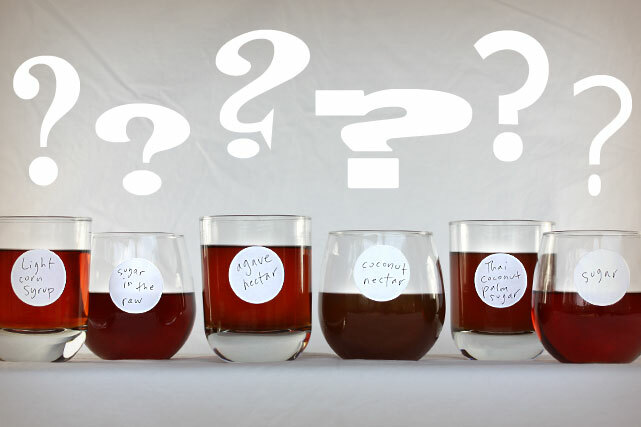 Readers, it’s hard to describe the flavor profile of sweeteners without merely calling them, well, sweet! 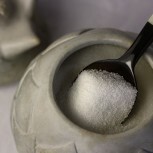 What are your favorite sweeteners, and how would you describe them? Leave a comment and let me know! 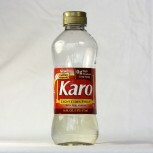 No, Karo is not HFCS, it is just corn syrup, meaning it is all glucose, no fructose. Health benefits? I think you are being played. You don’t really eat sugar for health benefits. The trace elements are too small to matter much. Nice article, though. Really appreciate this article and the research that is behind it! 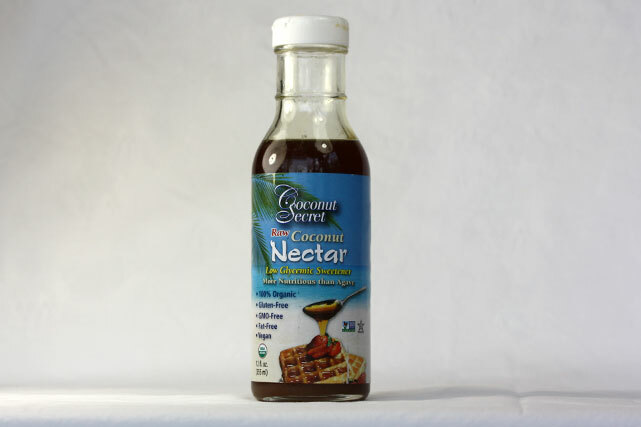 I love Coconut Nectar and it’s benefits, love the taste as well. Stevia is my go to sweetener, but just doesn’t cut it all of the time. The Coconut Nectar fills a great gap. I was surprised not to see Xylitol on the test. 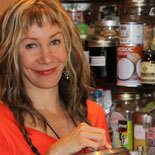 I do a lot of diabetic baking for people and love the results I get from Xylitol. Thanks for a great article! 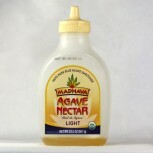 Especially being right on about Agave, which somehow got a “healthy” tag that stuck, marketing is to blame here??? Anyway, thanks!